A lovely sailing day with sunny intervals and a nice challenging breeze.The Gold fleet was won by Mike Pritchard who has now won overall with a game to play. Second place depends on last race with Roger Day and Bob Cuerstemont in their Supernovas battling it out, whilst Kevin Milton needs to win the last race to pip Bob for third place. Jill Reid is relegated and the last two relegation places are between Malcolm Davidson, Ray Kemish and Kevin Last. The silver fleet was won by Paul Jago from Nick Turnbull-Ross and Rob Corner. Nick Marlow leads overall from Paul Jago with three tying for third – Rob Corner, Josie Adams and Nick Turnbull-Ross so all last race next weekend. It looks like Derek Harbour, Dave Bexson and Jon Adams will be relegated. Nick Whiles won the bronze fleet from Mick Barker and Jamie Green. With one race to go Louis Mok leads from Nick Colbeck and Mick Barker but a good result in last race may enable Roger Chilvers and Nick Whiles to get on the podium. 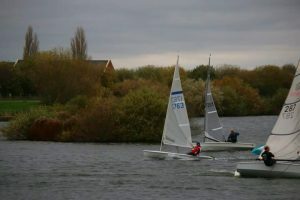 The fast fleet was won by Kevin Last from Kevin Milton and Roger Day. Kevin Milton has now won overall with a race to spare whilst second and third places are between Roger Day, Keith Brereton and Bob Cuerstemont. The slow fleet was won by Paul Jago from Mike Pritchard and Nick Turnbull-Ross. Paul Jago leads overall from Mike Pritchard and Ray Kemish.